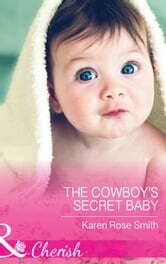 Suddenly a Father… When an injury forces Ty Conroy home to his family ranch, he comes face to face with a big secret. His son! Ty never anticipated being a dad, but there’s no denying that his amazing night with Marissa Lopez has come with consequences… Marissa wants to give Ty a chance as a father – so when he asks her to move to his ranch, she agrees. But Marissa knows that nothing – and no one – can keep a rodeo cowboy in one place. And when he left this time, she’d be damned if he’d take her heart with him… again.